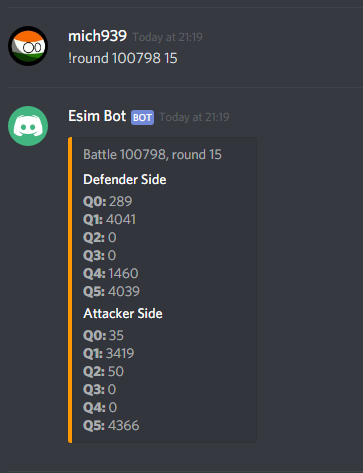 e-Sim - Esim Bot - 1000 users! 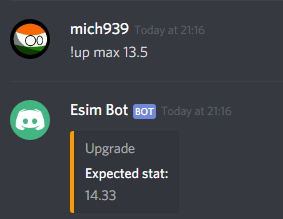 Do you like Esim Bot? Few months ago I was tired of calculating some things for 10min or even more every time I need them like weps used in battle etc. 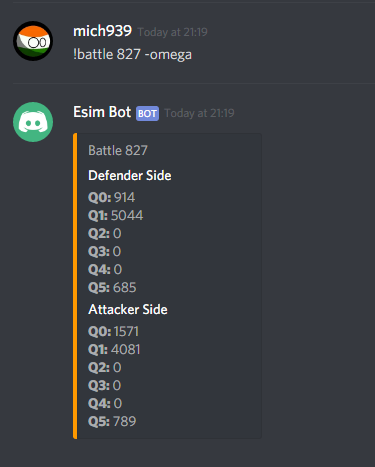 I've decided to make something what will help me with it - it is how the Esim Bot was born. 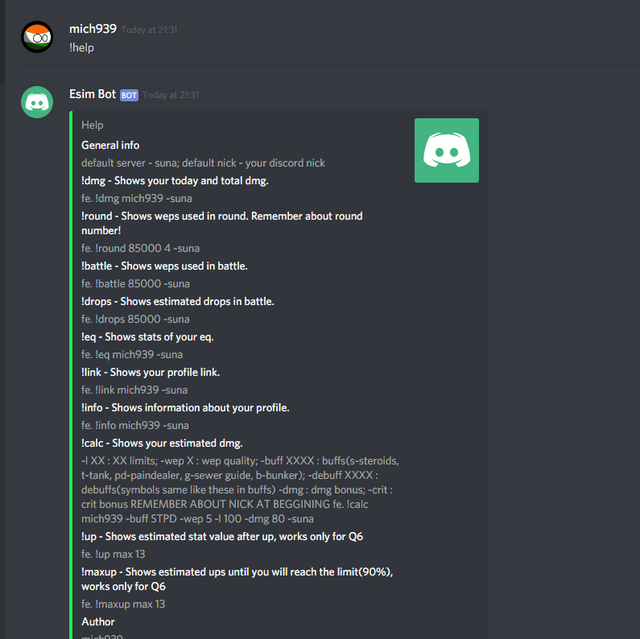 I was starting with no knowledge on Discord bot making but after few hours spent on various tutorials of Discord.js I've made first version with very basic commands like link or eq. 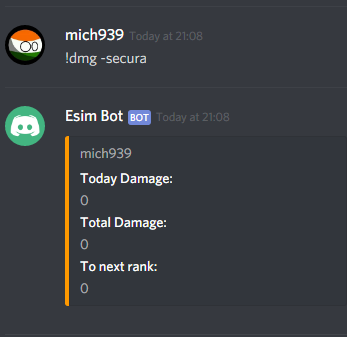 Later, day by day, I was improving bot by adding more and more commands. I've also invited it to Poland Suna channel. 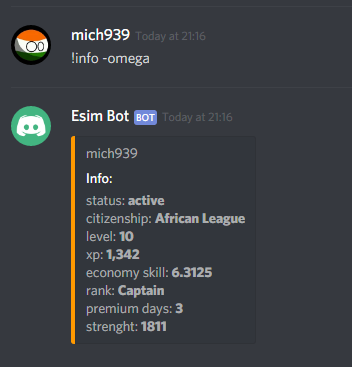 After few weeks people started to write PMs to me 'Are you creator of Esim bot? ', 'How to invite it?'. I was suprised. I was really suprised that people I sometimes even do not know want to have my bot. Yesterday bot reached 1000 users on 32 different servers - something I have not expected will ever happen. 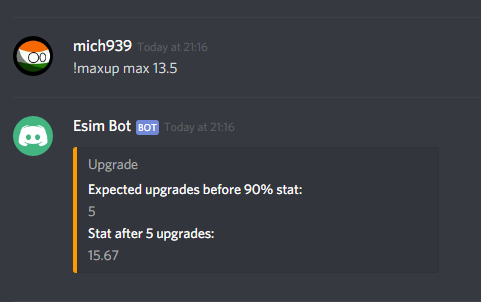 I want to say thanks for everyone who gave a try to my bot. Many people people forgot about that and add that they want suna server anyway, but you don't need to! You can just use command without specified server and it'll use suna. Shows your today and total dmg. 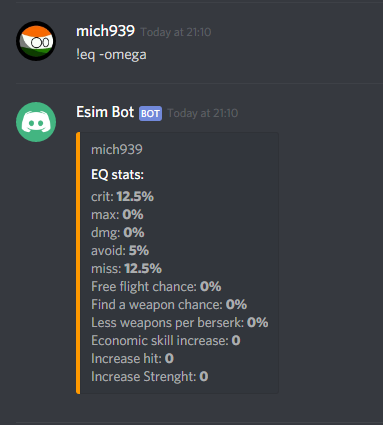 Shows stats of your eq. Shows information about your profile. !donate - Shows donate (money, products, eq) links. Shows weps used in round. Remember about round number! 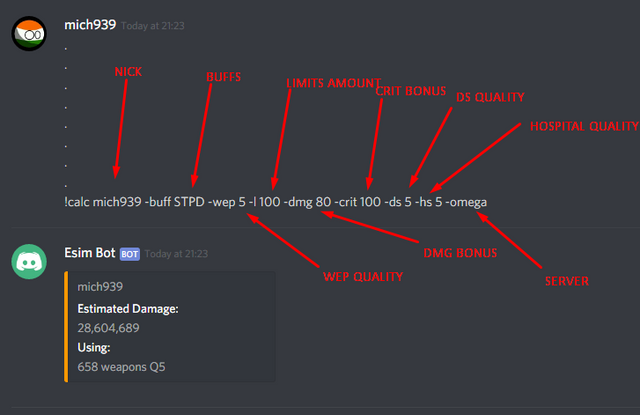 Shows weps used in battle. 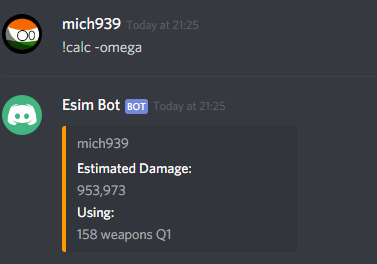 !calc - Shows your estimated dmg.